The WWE fittingly started this episode of RAW with a tribute to both Nikolai Volkoff and Brian Christopher Lawler, who both passed away on the same day in tragic circumstances. Lawler was reportedly found dead in a jail cell in Memphis after a DUI while Volkoff’s cause of death is yet to be disclosed. Brickhouse Brown, better known for his time in the USWA, AWA and CWA also passed away on the same day, aged 57 after a battle with cancer. The show proper opened with Roman Reigns cutting a pretty decent promo. I’m still a big believer that he doesn’t get enough credit for his improvement on the microphone. The Miami crowd were mostly positive but it seems that Roman’s program has been oddly booked. Losing to Bobby Lashley at Extreme Rules and then beating him last week in the #1 Contender match didn’t really put anyone over. Roman went about his usual “Brock doesn’t turn up to work” skit and somewhat awkwardly called out The Beast. There was also a great line from Heyman where he told Roman that “you sir should be in a padded cell instead of the main event of Summerslam” because what Reigns has been doing is the definition of insanity. The crowd loved it, Roman still looks strong and the booking remains consistent with the WWE addressing Brock’s association with the UFC openly. Free publicity, why not? 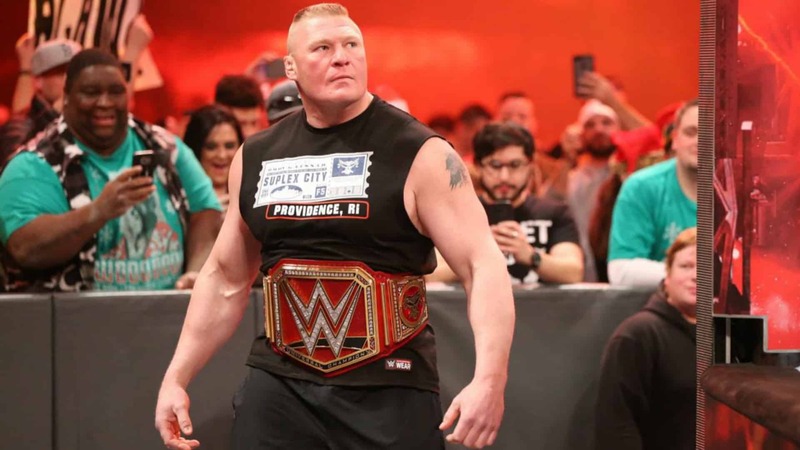 Before the next match began, the cameras cut backstage to Heyman trying to show Lesnar what went down ringside because Lesnar wasn’t actually watching the show. Heyman pulls out his phone, Brock throws it against the wall. The whole “I don’t care about the WWE” gimmick for Brock is perfect because it isn’t really a gimmick in the end. A good match which continued a storyline which I didn’t think could gain any traction after Balor defeated Corbin at Extreme Rules. The kids playhouse skit last week was hit-or-miss depending on who you ask but Corbin’s win this week certainly makes things interesting. The Lone Wolf did well to slow the pace of the match and build heat from the crowd and the pair told a good story in the process. Corbin looking to slow it down while Balor picked up the tempo in spots. Admittedly, there was just one too many submission moves from Corbin and the lack of pace killed the crowd towards the end. The match came to a close when Balor went for the Coup de Grace and missed, Corbin hit the End of Days and escaped with the win after Balor had all the momentum towards the end. Patches of the crowd were certainly getting behind Corbin who’s new gimmick has given him the push he needed. Corbin returned to the ring after the pinfall and beat Balor’s head against the barricade, ultimately extending the storyline for the pair which should lead to a blowoff match at Summerslam. Just hope that whoever does come out on top, gets a push towards the IC title. The promo began with Heyman walking with an assistant discussing what phone to get before Angle interrupted the pair. Kurt told The Advocate that Lesnar needs to get down to the ring because he’s under contract to do so, but Heyman said it wasn’t his problem. Angle quickly hit back saying that Heyman is under contract with the WWE and it will be terminated if Lesnar doesn’t get down to the ring at some point tonight. Fairly simple stuff from both of them but it did the job. Both Lesnar and Heyman get a little more heat and it makes Brock look like he doesn’t care about the WWE at all. Another fairly straightforward promo carried by Bliss at the start the completely ruined by Fox at the end. Bliss basically told Fox to just focus on her upcoming match with Natalya and she can take care of Ronda Rousey. “I’m gonna hurt Natalya so badly, I’m gonna make her cat say ‘me-ow”. Rousey is finally back on RAW after her suspension and she’s in Natalya’s corner while Bliss is there alongside Fox. Some great heel work from Fox throughout this one – she went for Rousey at ringside and while the referee was distracted, Bliss hit Natalya with a cheap shot, knocking her out cold. Still a weird finish given it was just a straight right hand. Rousey proceeded to chase down Bliss but Fox made the save. Then Rousey turned her attention to Fox and Bliss made the save, the numbers game ultimately catching up with the UFC Hall of Famer. Fox and Bliss escape and fans can expect a tag team match between the two pairs as they head towards Summerslam. Later in the show, the commentators confirm that Rousey will face off with Alicia Fox. Heyman is in the locker room with Lesnar pleading for him to go to the ring in order to continue lining his pockets with t-shirt sales and WWE Network subscriptions (of course). Brock keeps pushing this gimmick well and Heyman continues to sell well. The promo did take a weird turn where Lesnar asked Heyman to go get him a steak with baked potatoes and steamed broccoli. A tasty meal of course, but Lesnar continues to not care about the WWE which is giving him the heat that the WWE Creative so desperately want. Some more great work from Elias, who now has a documentary on the WWE Network as well as an album streaming on Spotify and iTunes. Honestly, he’s probably the most over heel right now on the roster. He even said that he could’ve beaten out Drake if it wasn’t for Bobby Lashley interrupting him last week. He even buried Pitbull and The Rock but was then interrupted by Bobby Lashley before he could start singing, much to my disappointment. Elias goaded Lashley into singing with him and the crowd absolutely loved it and surprisingly Lashley actually started singing. But after a few seconds of singing, Lashley was hit from behind by Elias who looked to get revenge after last week. Lashley quickly recovered and it looks like the start of a feud that could be big for both superstars if the WWE books it properly. Owens began the promo sucking up to Corbin, saying that the Lone Wolf is now his son’s favourite wrestler – he walks around the house in a vest and dress shirt. He continued by addressing his concerns that Strowman could cash in his MiTB contract tonight before Owens even gets a chance at winning it. Corbin wasn’t having any of it with Owens visibly frustrated that he’ll have no shot at the briefcase if Strowman does indeed cash in. A quick match where Owens quickly tried to steal the briefcase while Strowman was wrestling. The Monster in the Bank gave chase and was counted out, as Mahal won the match via count-out. It was a nice little reminder that Owens could win the MiTB contract via count-out or disqualification. Strowman returned to the ring as Mahal ran off through the crowd as the WWE try to make him look strong with three weeks until Summerslam. Quick shout-out to Jinder Mahal’s new gimmick which wasn’t expected but definitely welcome given he had such a strong push as the WWE Champion. A little tease for later in the night as Corbin hands over a phone with Stephanie McMahon on the other end. Kurt admits that “out fans on RAW are going to be very disappointed” and says Stephanie is just protecting the Summerslam main event. A nice tease that didn’t give away too much information. Rawley is backstage talking crap to the rest of the RAW jobbers, saying how he beat down Tyler Breeze and No Way Jose with ease. Enter Bobby Roode who immediately challenged Rawley as he continues his mega-push up the card. The pair brawled briefly and are separated by security. Finally the Authors of Pain are in a program but it’s certainly an odd one given they’ve been burying Titus Worldwide over the past couple weeks. A big win for Crews via a roll-up pin after Akam ran into the corner post. A very short match but FINALLY a program for both factions. I wouldn’t mind seeing the two face off in a Summerslam pre-show tag match, just do anything to give AoP some airtime on a major show. First things first: HUGE pop from the fans for Seth Rollins as he made his entrance. A classic strength vs agility story from both wrestlers with Rollins putting in yet another shift. Rollins basically had the match won after hitting the Curb Stomp before Dolph Ziggler jumped in to break up what would be the final pinfall. A brawl broke out but it was Rollins who walked away looking strongest. McIntyre continues to look like he can hang with the big boys and it’ll be interesting to see when he enters “Phase Three” of his return to WWE. A Rollins/McIntyre feud in the future would something great to watch. Kurt breaks the news to Roman that Stephanie McMahon wants him to leave the arena. Roman throws it back to him and argues that the authority has been keeping him down. There’s still hints of the old Daniel Bryan storyline where he’s been kept down by red tape, but it’s really not clicking with Roman because it’s being shoved down our throats as fans. He’s escorted out by some of the smallest security guards in the business and hits Corbin with a cheap shot on the way out. A weird decision from WWE to split them up but builds a little bit of tension for the next few weeks where we’ll inevitably see a brawl between the two where the locker room spills out to separate them. I’m sure there’s going to be a math between Corbin and Reigns next week as well. Bo Dallas and Curtis Axel completely oversell themselves as champions and the crowd has a somewhat mixed response. The lights quickly go out and the Deleters of Worlds appear out of nowhere and Bray Wyatt proves he’s still great on the microphone, ranting about how they are the B-Team’s very own nightmare. Both teams are interrupted by The Revival, a personal favourite team of mine. They exchange words before fists, the B-Team get out of the ring quickly as Hardy and Wyatt throw out Dash and Dawson. The Revival take on Hardy and Wyatt after the commercial break. With The B-Team on commentary, things get chaotic fairly quickly with Dawson driving Hardy into the barricade. The crowd aren’t interested at all, chanting “CM Punk” and “Rusev Day” throughout the entire match. A Shatter Machine on Bray Wyatt give The Revival a huge win and put them in the tag team title picture. The Deleters of Worlds meanwhile take on another loss and look to be on the same path that Hardy was on before taking on his Woken persona. Loss after loss before finally snapping. Could this be the introduction of Jeff Hardy? Rollins is interviewed following the tag team match but is quickly interrupted by McIntyre and Ziggler who beat him down quickly. A little unnecessary following the match but adds a little more spice to the ongoing feud. Sasha and Bayley have been looking great as a team and the teamwork continued tonight. Not sure how long this friendship is going to last OR who is going to eventually turn on who. I can see a Banks vs Bayley match headlining the Evolution PPV or a potential tag team title match setting them on course to be at the top of the card at Wrestlemania. The crowd was surprisingly into the match considering there was another tag team match on just prior to it. A great false finish with Banks dropping Morgan from the top rope with some flying knees. A backstabber from Banks led to the Bayley to Belly and the pair are looking great. The Boss n Hug Connection name is an interesting choice as well. Future storyline similar to Rock and Foley? Heyman is still pleading with Lesnar to go down to the ring with The Beast still unaware the Heyman’s job is actually on the line. Brock stretches and asks about his money, Heyman finally explains that his contract with the WWE is on the line. Lesnar grabs for Heyman and tells him they aren’t friends and it’s, in fact, Heyman who works for Lesnar and not the other way around. Which was odd because it never came across that way anyway. Would’ve been nice to have more of a build before suddenly having Brock turn on Heyman like that when they’ve had such a good relationship in the past? Kurt Angle comes down to the ring and calls out Heyman who comes down despondently. Heyman is clearly out of it and it’s easy to forget that he’s one of the best in the business. The crowd start chanting “na nana nah, hey, hey, hey, goodbye” and the commentators buy into the whole schtick. Heyman breaks the news that Brock won’t come to the ring and Angle absolutely snaps, probably his best performance on the mic in a while. He brings up charity events that Brock has missed and how he never defends his title. Heyman starts spilling out all these excuses to make him look like the good guy, saying it’s not his fault Brock doesn’t respect the business. Angle fires Heyman and the former ECW manager drops to the legs of Kurt before Lesnar finally came to the ring and asked if Angle had a problem with him. Then out of nowhere, Angle was hit with an F5. Lesnar then turned on Heyman, throttling him at the throat. This is probably the beginning of the end for the Lesnar/Heyman relationship but I still would’ve liked to see a longer build to this breaking point. That’s if it is a breaking point at all. Maybe all this heat on Lesnar is finally working, but watch WWE blow it somehow. Overall it was a pretty good episode of RAW, building more heat towards Lesnar while putting Roman over and getting ample time for the women’s division as well. Let me know your thoughts below and make sure you stay tuned tomorrow for the analysis of Smackdown! Big NBA fan? Read our latest news on Clint Capela here.